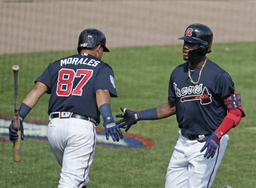 KISSIMMEE, Fla. (AP) When Ronald Acuna Jr. got back to the Atlanta Braves' clubhouse after getting his third hit of the game, Freddie Freeman acted surprised. "You should have kept going," Freeman told him, "and gone for the cycle." Acuna went 3 for 3 with a long home run and double off St. Louis opening day starter Miles Mikolas in Atlanta's 5-0 exhibition win Tuesday. It was the kind of performance the Braves have come to expect from the 2018 NL Rookie of the Year, and the kind of day Acuna expects from himself. Good enough that former Braves great Dale Murphy sheepishly asked Acuna for his autograph, demonstrating the stature the 21-year-old outfielder has achieved after less than a full season in the big leagues. "I've felt good from the day we started camp, but as the games progressed I've felt even better," he said through a translator. "I think with these last at-bats, just a little extra patience has gone into it. I've had good at-bats even if the results weren't what we would have wanted, but things are progressing quickly and we kind of see the results now." Acuna hit .293 with 26 home runs in 111 games last year, helping the Braves win the NL East after four straight losing seasons. His three homers are among nine hits in 25 at-bats this spring. The Braves open the season March 28 at Philadelphia. Last year, Acuna was not brought up to the majors until April 25. "I've been anxious for the season to start since we got here to camp. I've felt ready, I've been wanting this to happen," he said. "When the season starts is out of my control. All I can control is how I go about my business." Acuna led off 66 times as a rookie and subtly suggested early in spring training that batting first is his preference. But he has batted fourth most of the time this spring, including Tuesday, behind Ender Inciarte, Josh Donaldson and Freeman. "The mentality is the same for me - see the ball, hit the ball," he said. "As long as I'm in the lineup, I'm happy. Those decisions aren't up to me." Acuna figures to be in the Atlanta lineup for a while. "It's an impressive set of skills," observed Braves coach Walt Weiss. "The power and the speed combo is elite. He's not just a power guy. I think he's going to be a really good hitter his whole career, and when he gets rolling it's fun to watch." NOTES: Rookie RHP Bryse Wilson, continuing his long shot bid for one of the two unclaimed spots in the Braves' season-opening pitching rotation, gave up one hit and struck out five in four innings. Wilson, a fourth-round draft choice in 2016, has given up two hits in seven innings in his two starts.